As I stand here with the fear I always knew that you would be there through thick,and thin good times and bad you were the best friend I really ever had. I come to you with the trouble with the pain and sympathy, I had but realize that I can’t because your no longer here with me,you would brighten up my day with a beautiful smile on your face,you were always happy whatever you want through, if I could of told you my last words I would tell you I love you and I am sorry for those last words I’d spoken to you.you were something great and I knew if I had something to talk about I would always come to you.you will always be in my heart and memories and the best friend I ever knew..True friends always remain in each other’s hearts.a friend is someone who listens to you without judging,right or wrong,good or bad.when you are feeling low about yourself they gently help you to see the right perspective again.a friend reminds you of all the positive qualities.you forget you had.when you share with a friend,decisions are easier to make and problems seem less serious.a friend gives you a precious gift of time,to talk about new ideas and desires of reaching goals and accomplishing dreams.a friend loves you for who you are not what you do.feeling so accepted makes you want to try harder,and set higher goals,and accomplish more.through close friendship you learn the fine art of giving.you begin to care more deeply and enjoy sharing.seeing the happiness you bring to another person,increases your ability to love.wherever you may go in life a friend will always be with you. A best friend is someone who you can talk to,who won’t judge you loves you for you,and,most of all,makes you feel like you are worth something. A true friend is hard to find.is always on mind.is one of a kind.a true friend is someone like..you.it’s wonderful to have you in my world. A friend is someone who turn to when our spirits need a lift.a friend is someone we treasure for our friendship is a gift.a friend is someone who fills our lives with beauty,joy and grace.and makes the whole world we live in a better and happier place. 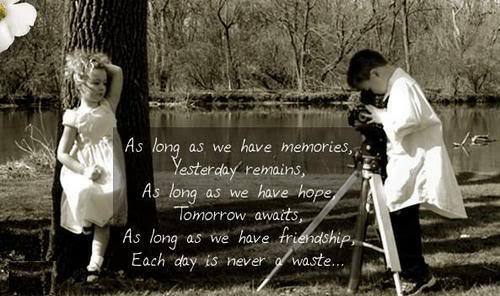 As long as we have memories,yesterday remains,as long as we have hope,tomorrow awaits,as long as we have friendship,each day is never a waste. Honest and true,no monkeying around,you’re the best friend,i ever found.always there,by my side,you never have to be the guide.you have a concern,might ask why,when i seem down,or start to cry.you take the time,make a comment or two,our friendship always,seem fresh and new. You may have someone in your mind,someone in your heart,someone in your dreams,someone in your life but.i’m your someone when you have no one as good friend. To be best of friends,is a true gift,to share things together,to care and uplift.in good times and bad,the bond will endure,whether happy or sad,the love will be pure.true friendship spans time,forever it will last.whether living close together,or being for apart,your friend is with you,in your mind and your heart. 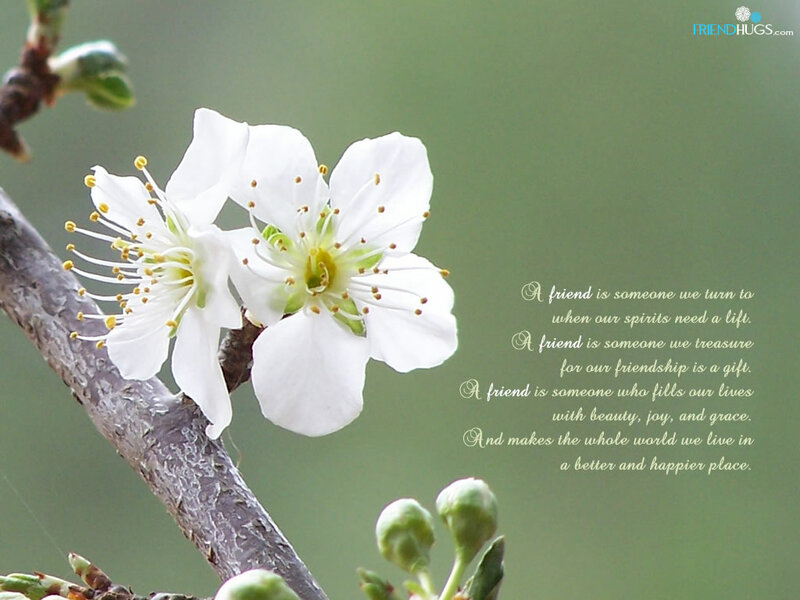 Sometime in life,you find a special friend;someone who changes your life just by being part of it. someone who makes you laugh until you can’t stop;someone who makes you believe that there really is good in the world.someone who convinces that there really is an unlocked door just waiting for you to open it. Heart is a crystal,preserve it,love is perfume,spread it,feelings are like,fluid flow it,friendship is just umbrella,come lets share it. Spending the first day with you,made me regret one mistake.it’s not spending my whole life with you,from the beginning,venting my ache. 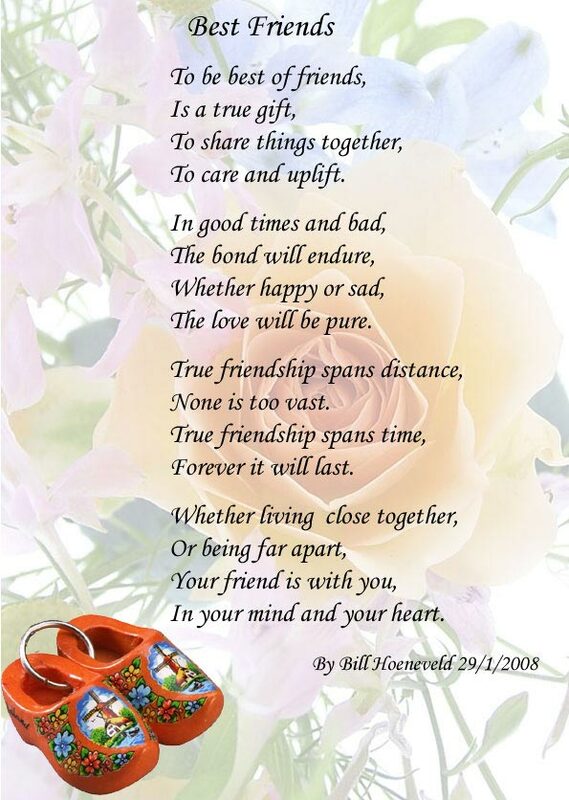 A bond strong,kind and caring,makes a friendship long,well worth sharing. Without you,life is a gloomy,dark,eternal coma.with you,life is a flower,charming with a delightful aroma. 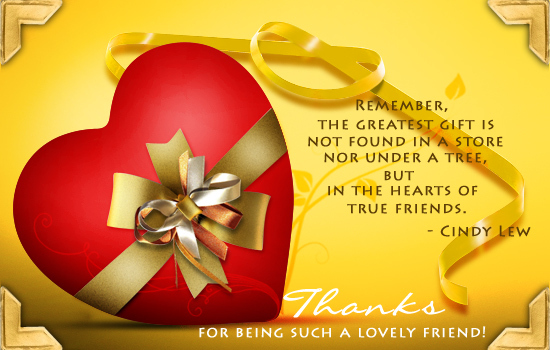 Remember,the greatest gift is not found in a store nor under a tree,but in the hearts of true friends. Have you ever felt like you knew someone a long,long time ago?another time,a friendship of souls?two people who share a bond for reasons neither know,a feeling that they were friends,a long,long time ago?did they stumble onto each other by pure circumstance,or was it fate and destiny that played a certain hand?two souls intertwined,they are worlds apart,but the soul,it knows no difference,in matters of heart.somehow they are drawn together,fate has brought them back,each living worlds apart,they journey separate paths,when this life is over,and a new life begins,their souls will find each other,two souls that we call friends. 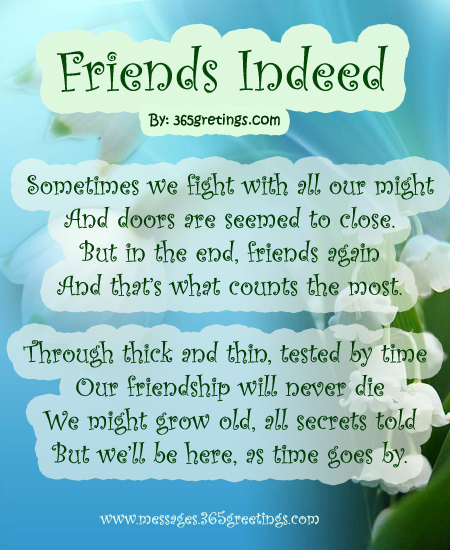 Sometimes we fight with all our might,and doors are seemed to close.but in the end friend again and that what the count most.through thick and thin tested by time,our friendship will never die,we might grow old,all secrets told,but we’ll be here,as time goes by. 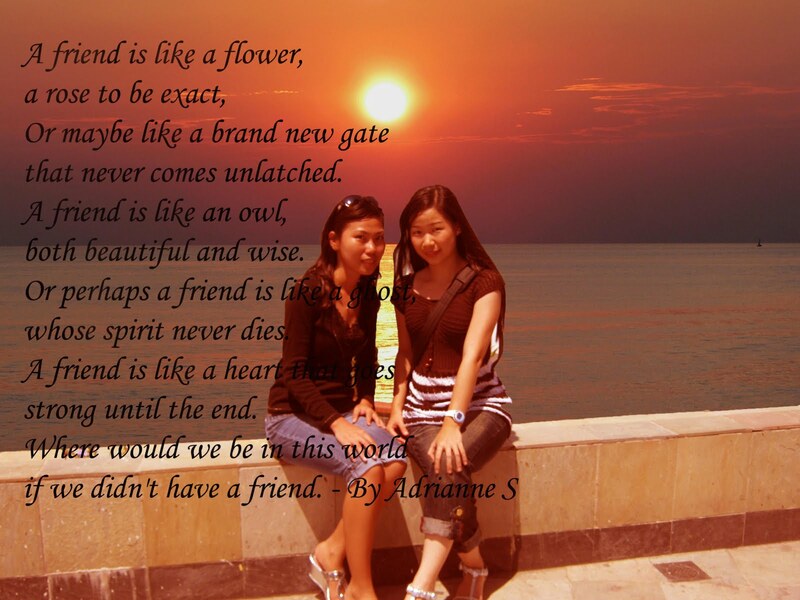 A friend is like a flower.a rose to be exact,or maybe like a brand new gate,that never comes unlatched,a friend is like an owl,both beautiful and wise.or perhaps a friend is like a ghost,whose spirit never dies.a friend is like a heart that goes strong until the end.where would we be in this world,if we didn’t have a friend. As you sit in silence,wondering why,i’ll be your shoulder to cry on,until your tears run dry.when you’ve been hurt,and can’t believe what they’ve done,if you need someone to talk to,i’ll be the one.if a close friend hurts you,and you don’t understand,remember i’m here,i’ll lend a helping hand.burdens are lighter when carried by two,and i just want you to know,i’m here for you. 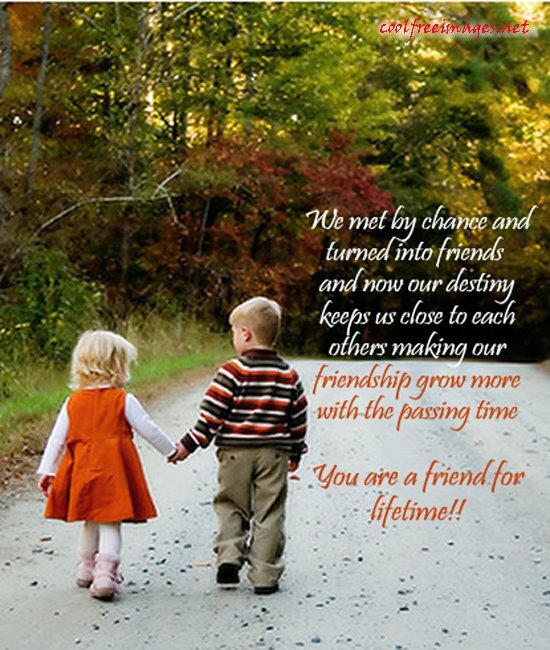 We met by chance and turned into friends and now our destiny keeps us close to each others making our friendship grow more with the passing time you are a friend for lifetime. 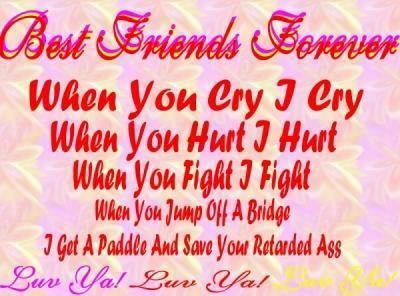 A friend is sweet,when its new,but it is sweeter,when its true!but u know what?Its Swetest when its you. May God grant you always,a sunbeam to warm you,a moonbeam to charm you,a sheltering angel so,nothing can harm you,laughter to cheer you,faithful friends near you and whenever you pray,heaven to hear you. There’s a wonderful thing,that gold cannot buy.a blessing that’s rare,and true.and that’s the gift,of a wonderful friend,like the friend i have in you. We shared smiles,we wiped the tears,and through the year,our friendship has grown along with us..you are truly a wonderful part of life. 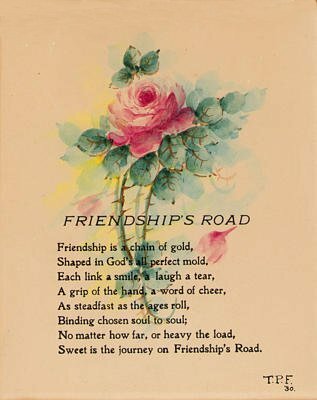 Friendship is chain of gold,shaped in God’s all perfect mold,each link a smile,a laugh a tear,a grip of the hand,a word of cheer,as steadfast as the ages roll,binding chosen soul to soul,no matter how far,or heavy the load,sweet is a journey on friendship road. 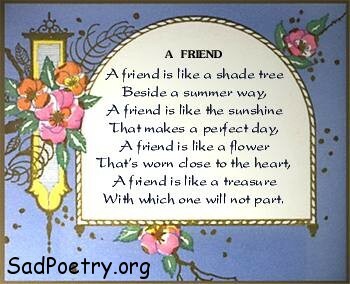 A friend is like a shade tree beside a summer way,a friend is like the sunshine that makes a perfect day,a friend is like a flower that’s worn close to the heart.a friend is like a treasure,with which one will not part. You are a ray of sunshine,in a world that’s sometimes grey.the magic of your company will brighten up the day.You’ve guided me through bad times,wiped away my tears,and brought me so much joy,as we’ve travelled through the years.it warms my heart to know,you chose me as your friend,a loyal,loving person,on whom i can depend.if i could have one wish,i’d make it just for you,i’d ask the God for His blessing in every thing you. 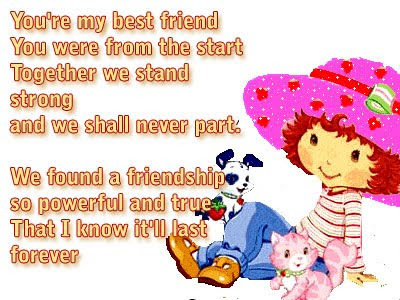 You’re my best friend,you were from start,together we stand,strong and we shall never part.we found a friendship,so powerful and true,that i know it’ll last forever. 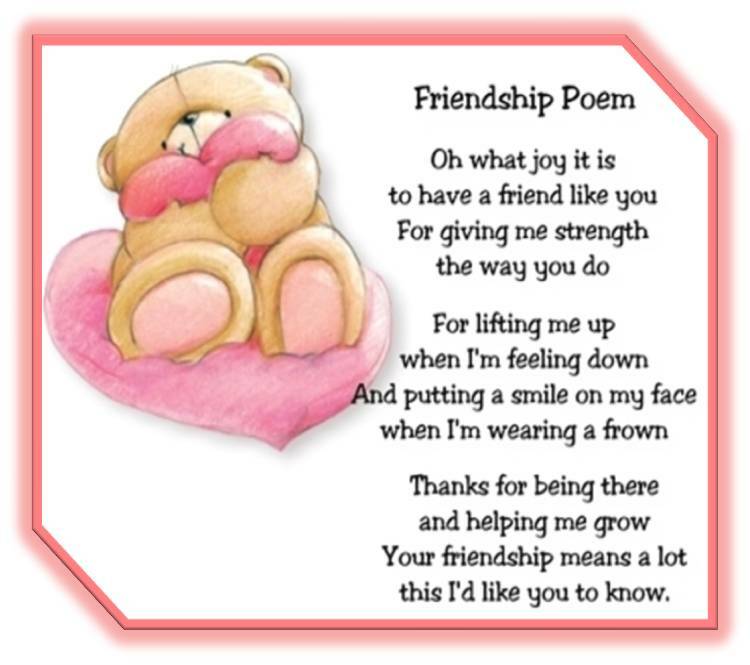 Oh what joy it is,to have a friend like you,for giving me strength,the way you do,for lifting me up when i’m feeling down,and putting a smile on my face,when i’m wearing a frown,thanks for being there,and helping me grow,your friendship means a lot,this i’d like you to know. I don’t need words to express.i don’t need tears to shed.i don’t need to ask for smile.or a hand to hold me.all i need is to be your friend,forever. 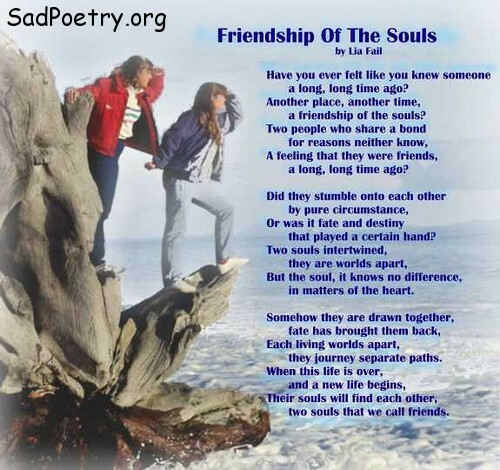 You are my friend,my companion,through good times and bad.my friend my buddy,through happy and sad,beside me you stand,beside me you walk,you are there to listen,you are there to talk,with happiness,with smile,with pain and tears,i know you will be there,throughout the year. I am loving the work you guys are doing with this website creative quotes, love them keep them coming.